‘When making this painting I was thinking about political posters of the Soviet era, North Korean propaganda imagery of the Dear Leader and the rich history of art in the service of myth creation and the seduction of public opinion from religion and politics to contemporary celebrity culture,’ says Peter Daverington. Self-portraiture is a new interest of Daverington’s and coincides with a shift in his work from landscape to figurative subjects. In 2012, he made a series of works representing himself within formats usually only designated to saints, pop stars, cult leaders or tyrants. 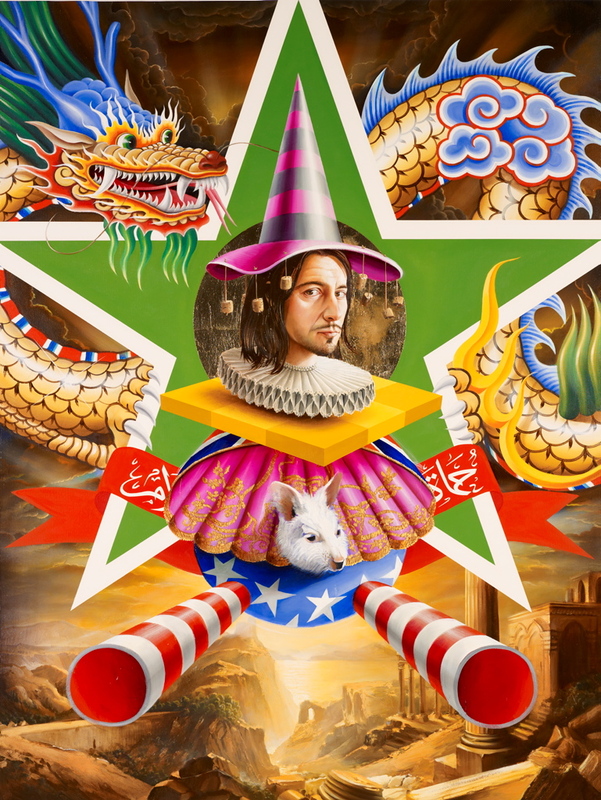 ‘To make these works I employ a wide range of methodologies and historical references ranging from the Italian Renaissance, Byzantine icon painting, Romantic landscape painting and occidental and oriental heraldry to pop and the graphic arts,’ he says. Born in Melbourne in 1974, Daverington began his artistic life as a graffiti artist. After travelling for 12 years, he returned to Australia to complete a Master of Fine Art at the Victorian College of the Arts. He is also represented in this year’s Sulman Prize.